The board, staff and students at Pontiac Christian School are extremely grateful that you are considering supporting us. Please pray for us, that we may continue to educate children in our area for the Kingdom of God. 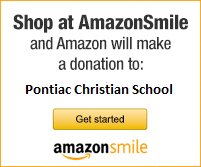 Pontiac Christian School is a registered 501(c)(3) non-profit organization. Therefore, your donation is tax deductible under the Internal Revenue Service Code. In PayPal, please SELECT “Share your mailing address with Pontiac Christian School so they can acknowledge my donation” so we can mail you a tax donation letter. All donations must be postmarked by Dec 31st to count toward that year’s taxes. We now accept PayPal also.